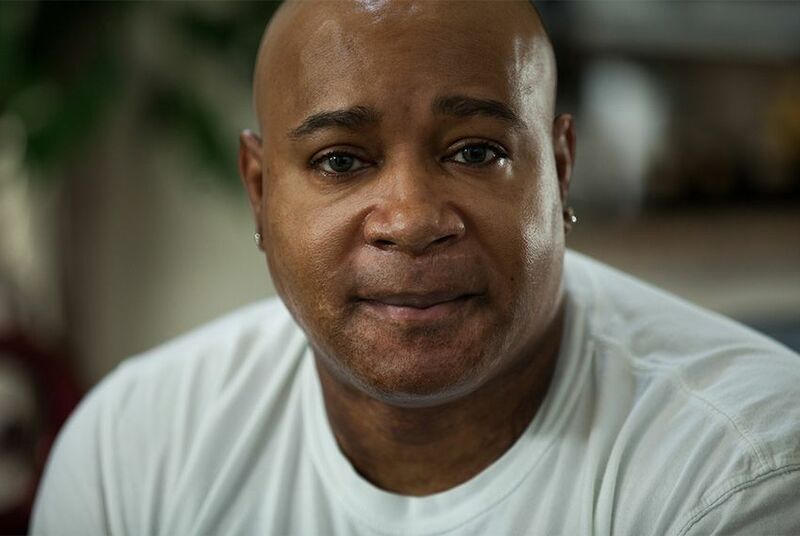 Austin lawyer Brad McClellan became convinced a few years ago that one of his clients, a black man who had been horribly injured at a smelting plant in West Texas, faced discrimination from the insurance company handling his workers’ compensation benefits. Then as he pondered the long line of black and Hispanic workers seeking his legal help, McClellan wondered if injured minorities, statistically speaking, received equal treatment when they requested benefits or faced disputes. The answer, contained in an email from the Texas Division of Workers’ Compensation, shocked him: It is virtually impossible to know. A spokesman for the division, John Greeley, acknowledged that the agency does not maintain racial information on every compensable injury. If employees do not disclose their race or ethnicity, he said, the state does not reject the claim or halt processing. In addition, the electronic forms that insurers send in have no field for race. The agency’s lapse in maintaining complete racial data in its claims process has prompted state Rep. René Oliveira, the Brownsville Democrat who oversees the division as chairman of the House Business & Industry Committee, to press the agency to begin collecting the information as soon as possible. Oliveira said it was the second time in recent months that the Division of Workers’ Compensation, part of the Texas Department of Insurance, had not complied with its duties under state law. He said when he meets with agency lawyers to discuss the lack of racial data he plans to ask if there are any other required duties that are not being performed by the division. The Texas Tribune revealed in June that the agency was not staffing its 24-hour safety hotline around the clock. The division later announced that it had taken steps to staff the toll-free hotline day and night as required. The state used to do a better job of gathering such information. Records provided to McClellan show a majority of the claims tracked electronically included race when the law first went on the books in the early 1990s. 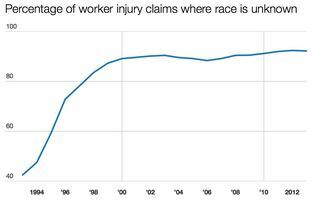 But compliance has slipped, and by last year less than 8 percent of those claims indicated a worker’s race and ethnicity. 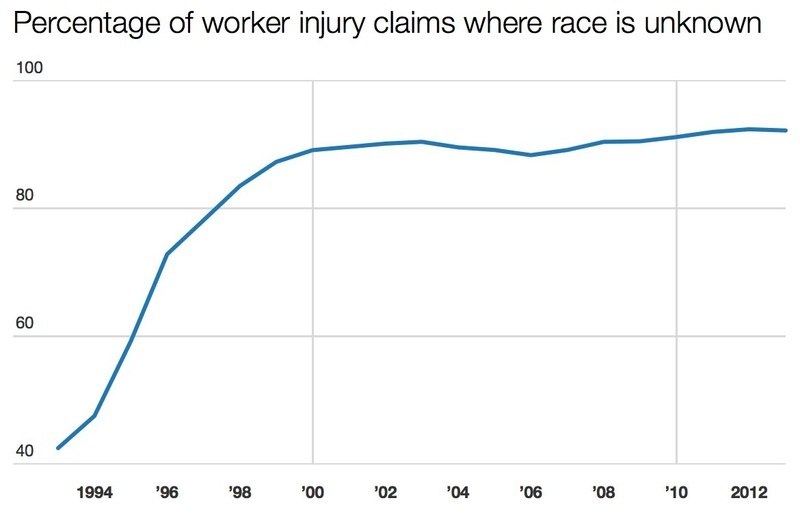 When state government employees get hurt at work, the form used by the State Office of Risk Management to record injury claims does not even include a field for race. Oliveira and advocates for workers and minority groups say there is good reason to track the race and ethnicity of workers who get hurt or killed on the job. A February 2013 study by the U.S. Bureau of Labor Statistics found that in recent years, Hispanics have been more likely to die on the job than other racial groups. Foreign-born workers, who are less familiar with English and American safety guidelines, are particularly vulnerable, the study found. In Texas, the only state in the country that does not require private employers to provide workers’ compensation or a private equivalent, many unskilled Hispanic workers have no occupational insurance coverage and seek care in emergency rooms when they get hurt. Even when workers do have workers' compensation insurance, their employers often discourage them from reporting injuries and employers sometimes erroneously tell their undocumented employees that they do not qualify for benefits, said Emily Timm, deputy director of the Workers Defense Project in Austin, which advocates for low-income workers. Bill Hammond, CEO of the Texas Association of Business, said he did not know if undocumented workers faced pressure to avoid filing injury claims. If that's occurring, he said his group would gladly "be part of an effort to stop it because that would be wrong and unfair." "I can understand why legislators want the data collected and if the statute indicates they’re supposed to do that then they should collect it,” Hammond said. “If we had the data we might be able to draw some conclusions." McClellan said he believes minorities are treated more harshly in the dispute resolution process inside the workers’ compensation system — where benefits can be difficult to obtain even under the best of circumstances. He said one of his clients, Glenn Johnson — a black man married to a white woman in rural West Texas — faced what he believes were discriminatory actions from the insurance company carrying his workers’ compensation policy. Glenn Johnson, 55, was injured in a smelting accident near Amarillo in 1997 in which a furnace filled with molten metal exploded, crushed him and left major burns over 90 percent of his body. His left arm was amputated, and all but two of the muscles in his right forearm were removed. He now suffers from depression, chronic respiratory problems and muscle pain. Working out, Johnson said, was one of the only things that kept him going. 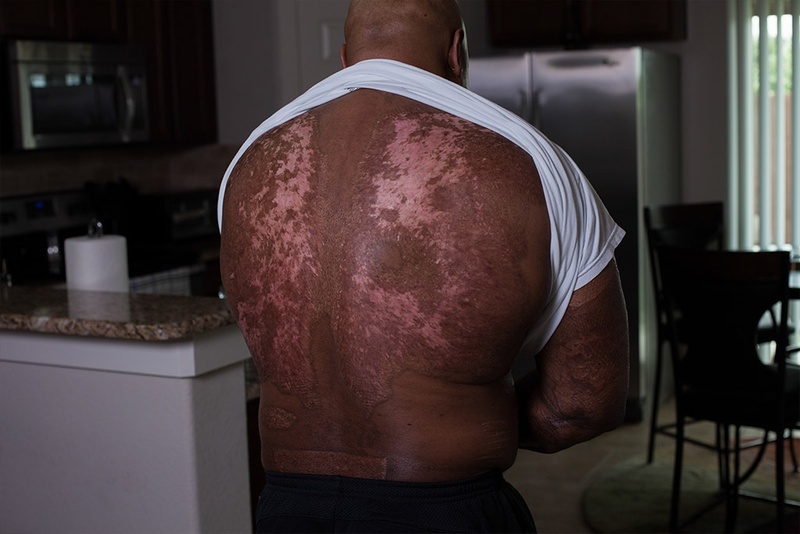 Injured in a 1998 smelter explosion in Amarillo, Johnson sustained second- and third-degree burns on his face, neck, upper body, legs and arms. One of his arms had to be amputated. The other was badly mangled. As part of his rehabilitation, Johnson, who lived in a small town, worked out at a gym a couple of hours from home. Insurance adjusters suspected he was not using the gym and filed a criminal complaint against him, records show. Soon thereafter, a grand jury indicted Johnson for insurance fraud, saying the evidence showed he had falsified travel reports. The charges were dropped after gym employees signed affidavits attesting to his attendance. But in a multimillion-dollar lawsuit filed against Old Republic Insurance Company for bad faith, malicious prosecution and other alleged misdeeds, Johnson’s lawyers argued the insurer continued to deny him the benefits and medical treatments he was due under state law. That case is still pending. Tod Mayfield, who represents Old Republic in the lawsuit, declined to comment. McClellan provided a copy of Johnson’s electronic “claimant information” file from the workers’ compensation agency showing blank fields for his race and ethnicity. Knight-Mozilla Fellow Marcos Vanetta contributed to this story.